Dimples: Dimples may have clinical significance if they are at the level of lumbar or upper sacral spine. A dimple must be distinguished from the benign coccygeal pit localized over the lowest point in the coccyx in the gluteal fold. 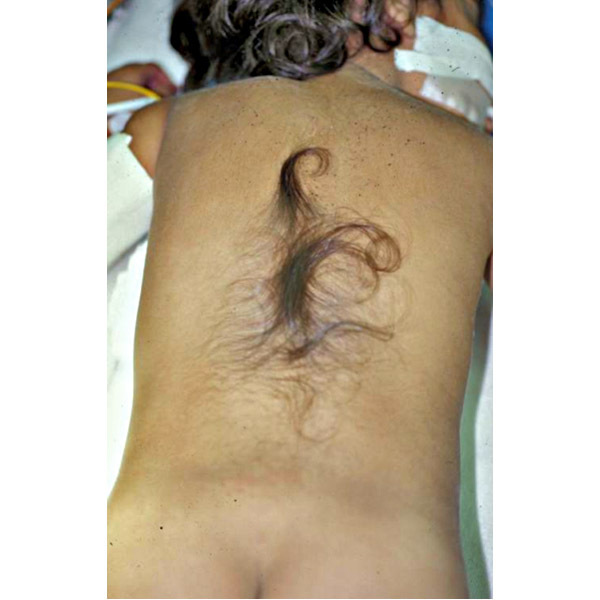 Hypertrichosis: A tuft of hair is present over the midline lumbar spine. A hairy patch marking a tethered spinal cord: A fawn’s patch is observed over the midline of the thoracolumbar spine in a 5-year-old girl. Hemangioma: A hemangioma over the dorsal midline raises concern of an occult tethered spinal cord. Dermal sinus: An opening in the skin in the midline above the gluteal cleft. 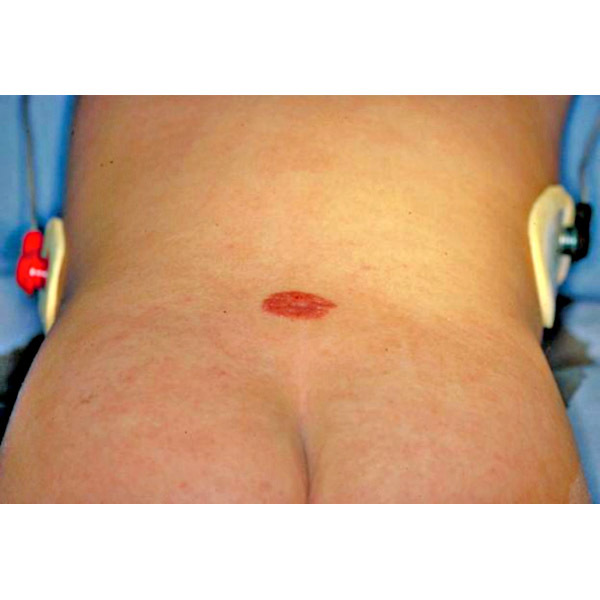 A dimple at the end of the coccyx is most likely a benign sacral dimple. Subcutaneous lipomas: A palpable, nontender subcutaneous mass of fat is present in greater than 90% of patients with underlying lipomyelomeningocele (9). Lower extremity weakness: Weakness may affect both flexor and extensor muscles in the legs and may alter the gait. Muscle atrophy: Muscle atrophy from nonuse or loss of spinal innervation in the lower extremities may occur. Sensory changes: Sensory loss in the perineum or either leg may be observed. Radicular pain: Severe pain in the lower back with radiation into either leg, groin, and the perineum may be seen. Abnormal gait: Toe-walking, due to tight heel cords, and other abnormal patterns in gait due to weakness may be present. Limb deformities may be present at birth or may be progressive in nature. Foot deformities: Deformities such as high arched feet and clawed toes may be seen. Leg length discrepancy: Discrepant limb length and progressive scoliosis may be present. Difficult to differentiate from norm: Symptoms are difficult to discern as urologic disturbances are common among school-aged children. Symptoms in the normal population resolve spontaneously with increasing age. Change or regression: Symptoms include an abnormal voiding pattern or regression in toilet training. Recurring urinary tract infections: Frequent urinary tract infections are an ominous finding in a young child that suggest possible conus dysfunction. Variable: With cutaneous stigmata at birth, the child may be followed and surgery performed usually before a year of age. With progressive symptoms, expeditious surgery is warranted. Variable: Symptoms may present with a more rapid onset in a patient undergoing growth spurts or one who is extremely active. History: A history often elicits the presence of pain, numbness, tingling, bowel or bladder dysfunction, and weakness. Studies: Ultrasound of the spine should be obtained if the patient is younger than 6 months. MRI is the study of choice to evaluate conus position and pertinent surgical anatomy. CT of spine should be obtained if bony anomalies are present. Urodynamic studies are needed if bowel/bladder issues exist. Surgery with the goal of untethering the spinal cord is the management option to be considered at the time of presentation. Rarely is emergent intervention required. Imaging: MRI is usually done. A CT scan can be considered to evaluate the associated bony anatomy. Urological assessment: The child’s urological function should be documented. This may require a urology consultation and urodynamic study. EMG: Electrophysiological studies of the legs musculature can be considered.